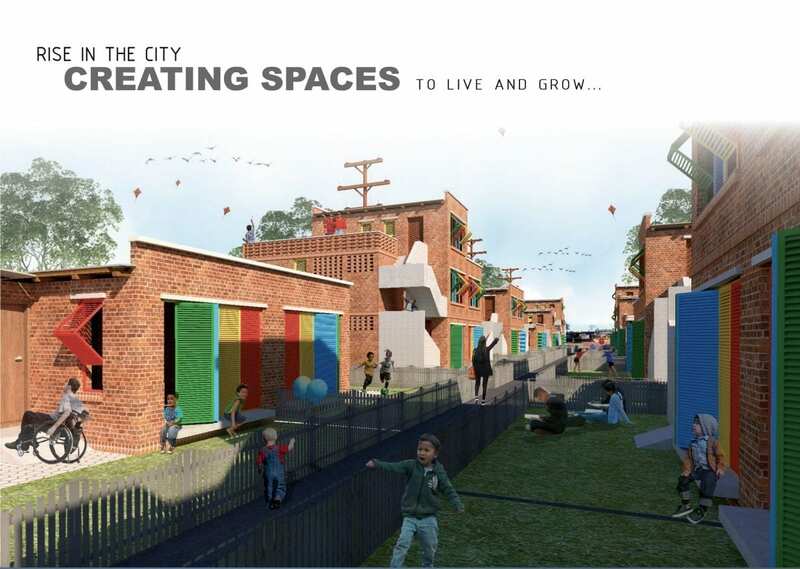 DawnTown, an annual architectural ideas competition since 2007, has become a huge success. Attracting over hundred entries from more than 20 countries in 2010, this quest to bring innovative architecture to Downtown Miami has become a staple in the international design community. 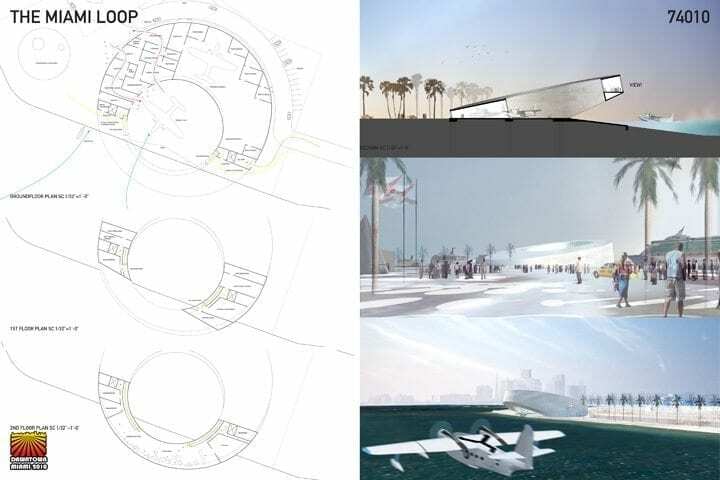 Its latest installment, the 2010 DawnTown Seaplane Terminal Competition, focused on issues pertaining to waterfront and infrastructural development, and asked the participants to investigate landscape and architectural opportunities that would reenergize the coastal growth of Miami. 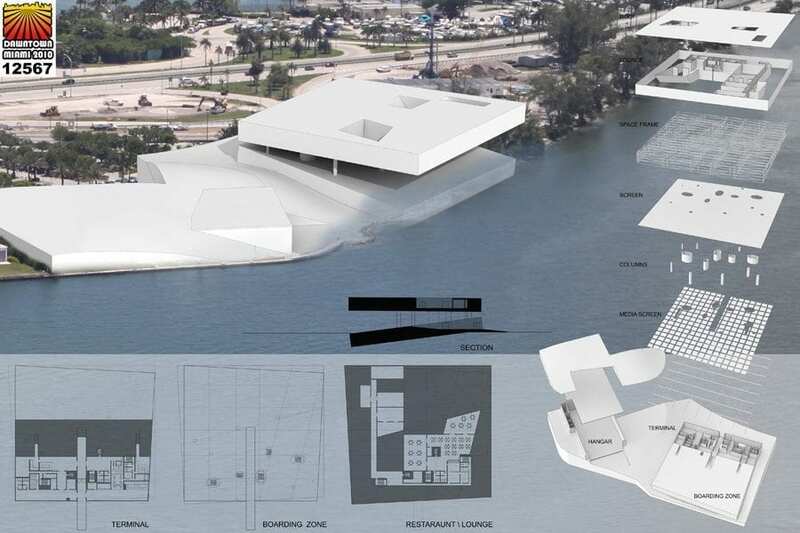 Watson Island — the site of this year’s competition — holds a dynamic and important position in Biscayne Bay off the coast of Miami. The island was created by land reclamation in 1926 from the dredgings for the shipping channel that provided access to the Port of Miami. It is close to downtown Miami, and can only be accessed by the Macarthur Causeway and Bridge that help comprise highway 395, a major artery for Miami that services Miami Beach. Due to its location, the land has had a history of increasingly more prominent usage. In 1932, Watson Island was considered for the site of Miami’s Pan-American Exposition, a World’s Fair and “International merchandise mart.” Since 1946 it has been home to the Miami Outboard Club and Marina as well as the Miami Yacht Club. The island also housed a seaplane terminal named Chalk’s for several decades. In the Summer of 2003, an animal attraction called Jungle Island relocated to the island and two years later, the Miami Children’s Museum followed suit. Lately it has been the focus of renewed attention with large investments on infrastructural development as well as a planned luxury hotel complex that includes retail, residences, and a marina for mega yachts. A new project, the Miami Port Tunnel, further anchors the importance of the island and its location by connecting Watson Island to Dodge Island, the home of one of the largest cruise ship and cargo ports in the world. The project will traverse under the shipping channel, and is intended to alleviate the current traffic congestion in downtown. 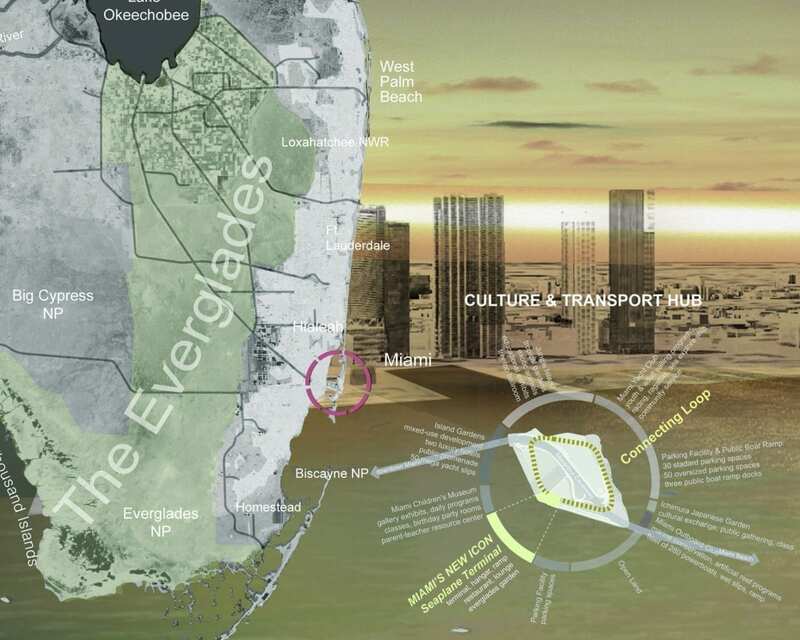 As the city’s western expansion toward the endangered everglades is finally coming to a close, Watson Island continues to affect Miami’s urbanism, infrastructure and future. With limited areas to grow, Miami is experiencing a resurgence of its downtown and a rethinking of the spaces in the city proper. The future of Watson Island is proving to be a nexus of infrastructure and development that is a key to the city. The re-introduction of the seaplanes would create a cheap and flexible way to bring people to experience all that Downtown offers: the largest financial district south of New York City, two brand new state of the art museums, a public park, a world renowned performing arts venue, a world championship caliber basketball team, and a major cruise ship terminal. Similar to the train system that helps link the northeastern states of the country, this project intends to connect Florida and the Caribbean. The creation of a genuine seaplane terminal would help define Downtown Miami as a major transportation hub. 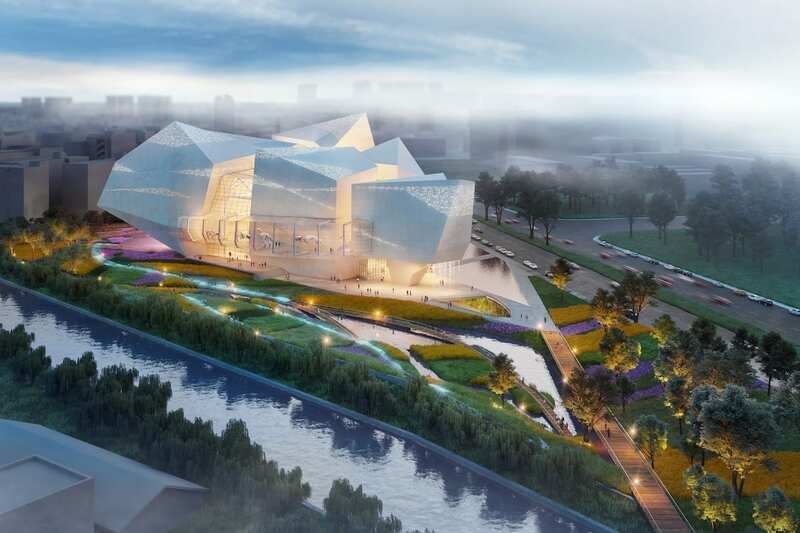 The brief of the competition called for the creation of an iconic and memorable place that would bring significance to Watson Island. The program asked for the design of a new seaplane facility consisting of a terminal, hangar, site accommodations and a restaurant / lounge. Participants needed to consider the climate of Miami and incorporate sustainable criteria in dealing with the environment. Furthermore, the designs had to be innovative and express the spirit and civic pride of Miami and the importance of transportation infrastructure. 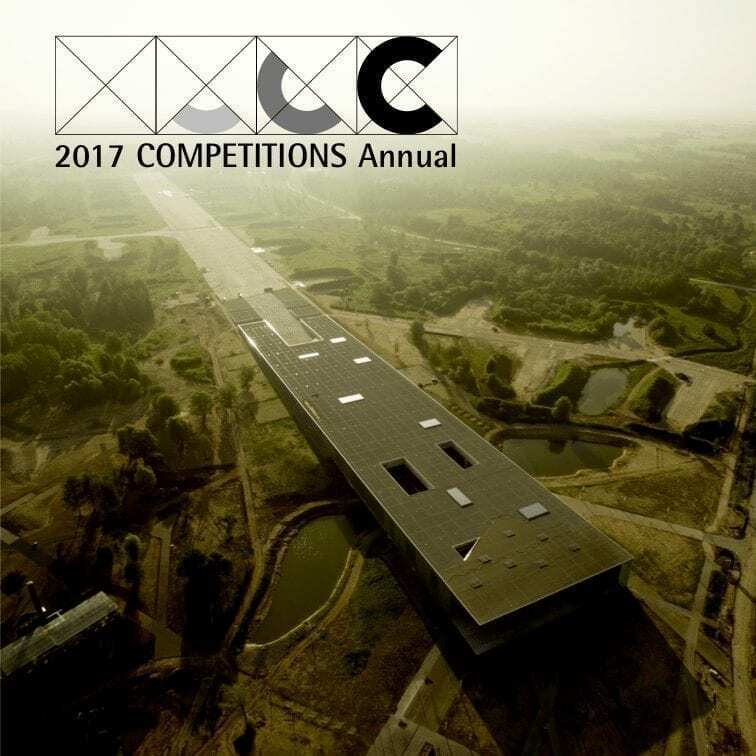 The winning entry and the other awarded projects provided a plethora of innovative criteria in producing architectural effects that heighten the relevance of movement synchronized with landscape and waterfront development. 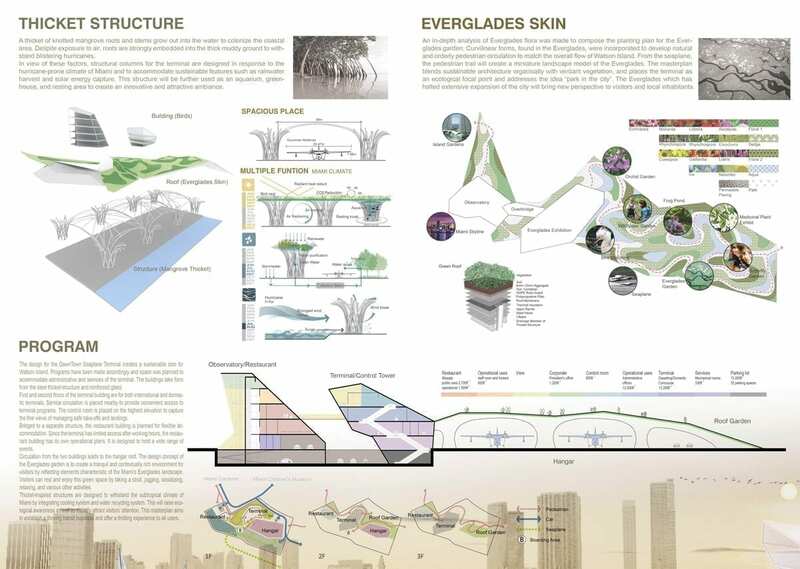 “Miami Glades” by CA Landscape, Trevor Curtis + Sylvia Kim from Seoul South Korea is the first place winner. 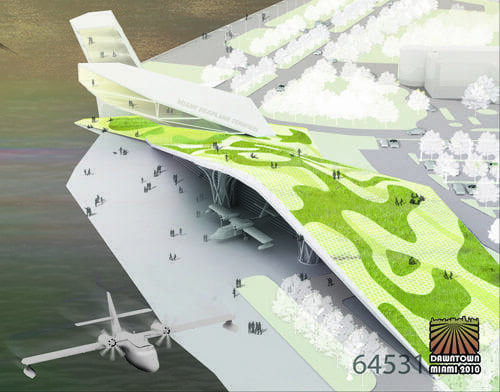 The project takes the solution of the seaplane terminal to a much larger scale of reference, that of the landscape and the larger community. The building serves its elegant iconic purpose as the culmination of a networked ecology that emphasizes the relationship with nature. As a result this provides a beautiful understanding of the structure by mimicking the unique South Florida Landscape. 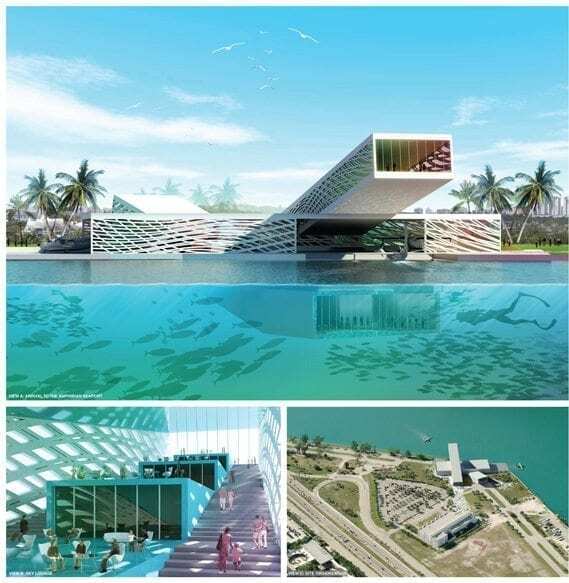 The roof of the seaplane hangar becomes a natural park offered to the city as a public experience that recreates the wildness of the Everglades, a topography that doubles up as urban event and infrastructural envelope. This large roof is “lifted” from the ground, revealing a structure of bundled tubes that evoke the dense, complex roots of the native vegetation found in the material organization of mangroves and strangler fig trees. 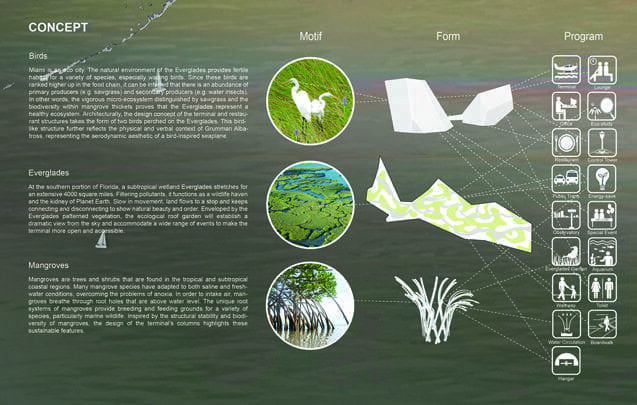 The second place winner, “Amphibian” by Stantec, Vicky Chan, Alex Zulas, Liange Otero Colon from New York City, was chosen for its strong connection to the water. The project takes advantage of it through the plan geometry which juxtaposes four linear components that absorb the predominant direction of privileged visuals and axial alignments of the site. It questions the flatness of the ground level by partially submerging the building along oblique sectional trajectories, creating unprecedented effects for submerged views. It uses the simplicity of its geometry to create a whimsical idea. 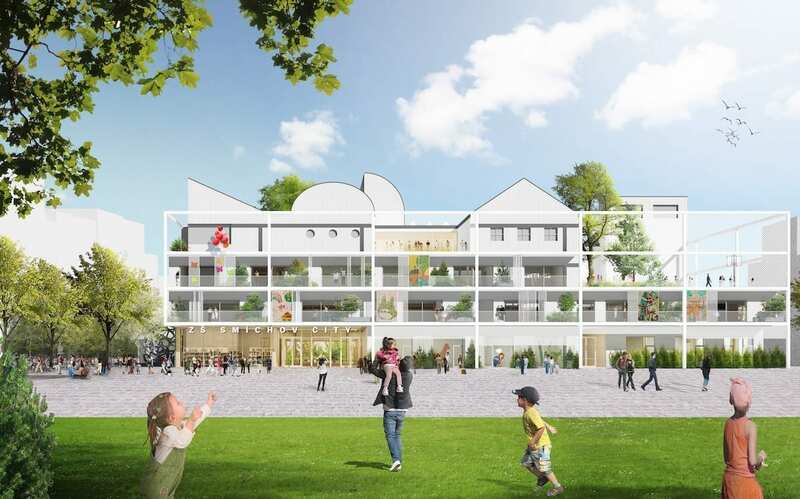 The project relates to the site very well, and establishes relationships that just seem spectacular, creating fantastic visuals and surprising experiential conditions in terraced interior arrays. Even though the skin of the building’s components filters the light and the views, the envelopes seem too constraining and hermetic. Perhaps the project would have benefitted from the exploration of a more open configuration. 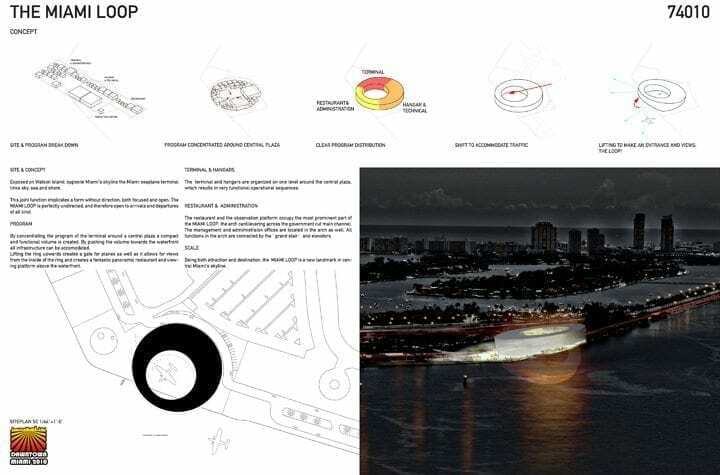 “The Miami Loop” by Gerd Wetzel + Martin Plock from Basel, Switzerland is the third place winner. The Loop offers a very strong scheme, a synthetic approach to form that consolidates the diverse programs into a ring-like organization around an open court for boarding. Because of its form, the Loop makes for a great compliment to the American Airlines Arena just across the bay. 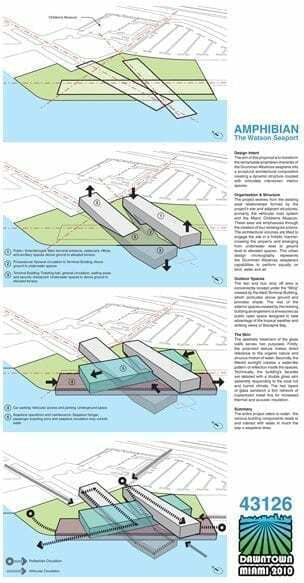 The building is lifted sectionally in a gesture that facilitates the accessibility of the planes and creates a dramatic relationship of the building in contrast to the surface of the water on one side, and the plateau that it is encrusted into, forming the access plaza. The circular form creates some organizational challenges for the solution of the plans, which are resolved in a tortuous manner and without recognition of the potential advantages of the radial geometry. 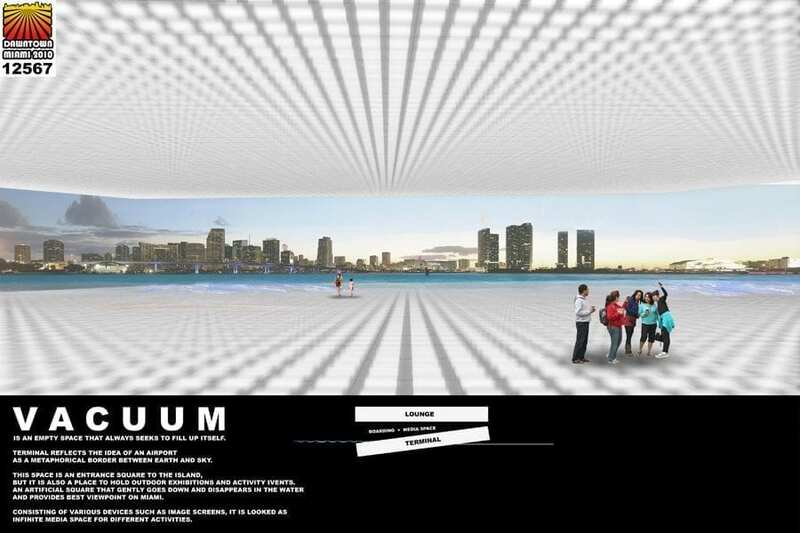 “Vacuum” by Nikolay Martynov from Moscow, Russia, sets the stage for an ideal appreciation of the Miami skyline underneath a mega-canopy reminiscent of Mies Van der Rohe’s “universal space” concept, and a reference to the sublime dimension of the landscape. 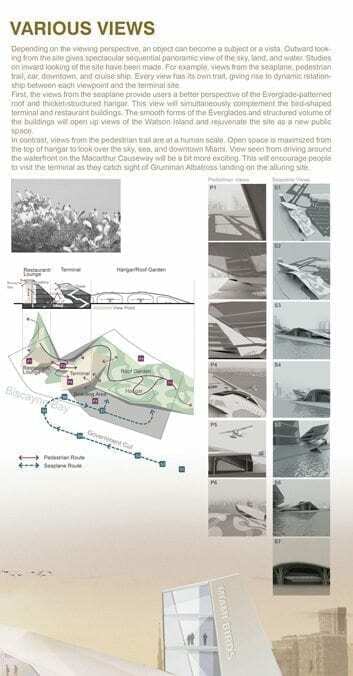 Most of the program is placed on this floating, thickened canopy which liberates a vast plinth that suffers from certain degree of indeterminacy as well as having a remote connection with the actual movement of the seaplanes. “Miami Breath” by Zerovolume, JungSeung Young , Joo Hee Kim from Seoul, South Korea, creates striking presence on the landscape. 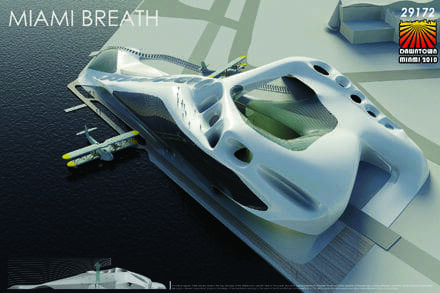 The morphology of this terminal evokes the fluidness of the water as well as the erosion and filtering of wind. 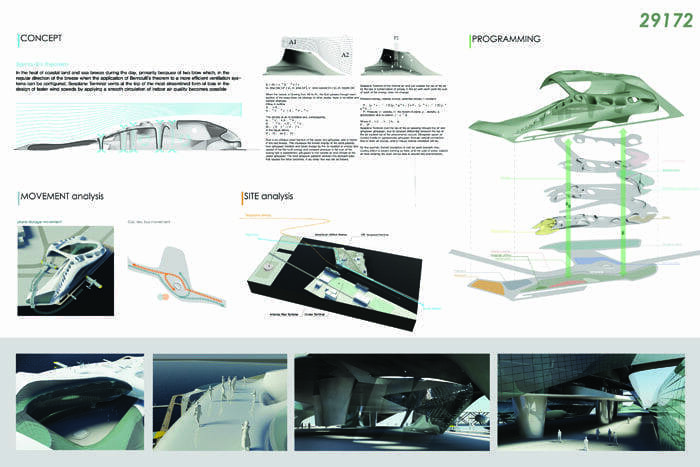 The porous surfaces indicate very interesting performative possibilities in terms of channeling flows of passengers, although that energy seems misplaced as it only stands as visual allegory to aero-dynamics, a metaphor explored by iconic architectural works such as the TWA Terminal by Eero Saarinen. 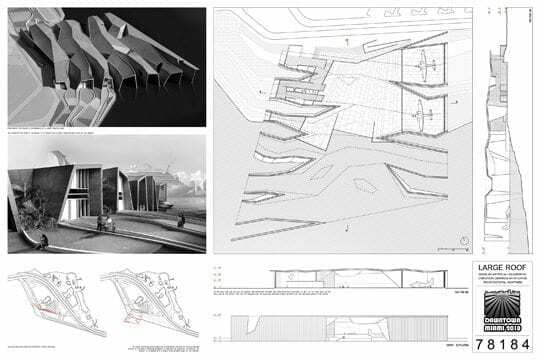 “Large Roof” by NC-OFFICE, Nik Nedev, Peter Nedev, Elizabeth Cardona, Cristina Canton, Jorge San Martin from Miami, FL, sets up a field condition that articulates a corrugated concrete roof, an echo of other Miami spectacle icons from the 50’s and 60’s such as the Miami Marine Stadium. 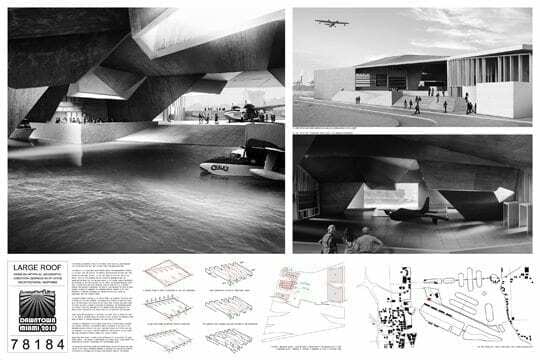 It is able to resolve elegantly the necessary large spans of the hangars and it introduces a dark, shadowy atmosphere of brutal use of concrete which gives it a strong expressive character. The interior program argues against the heaviness of the project. 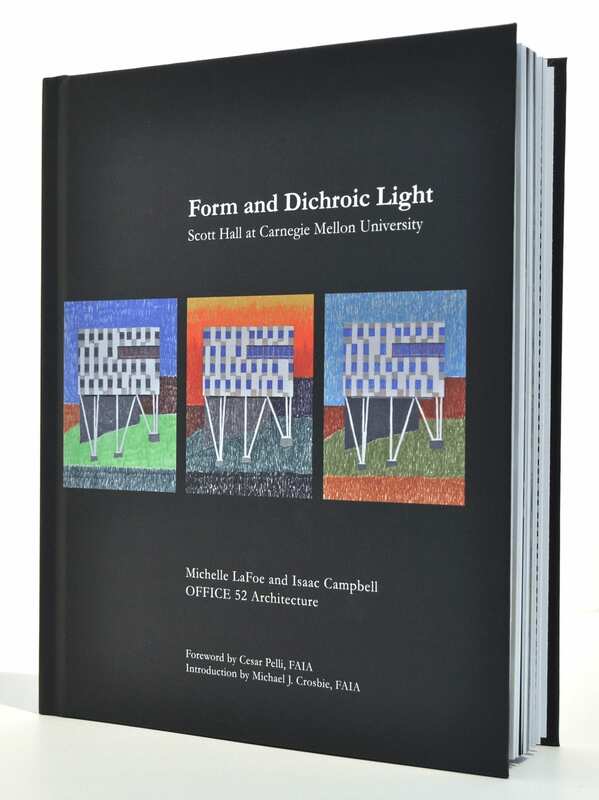 However, once one examines the interior and contrasts it to its exterior, the project falls apart. 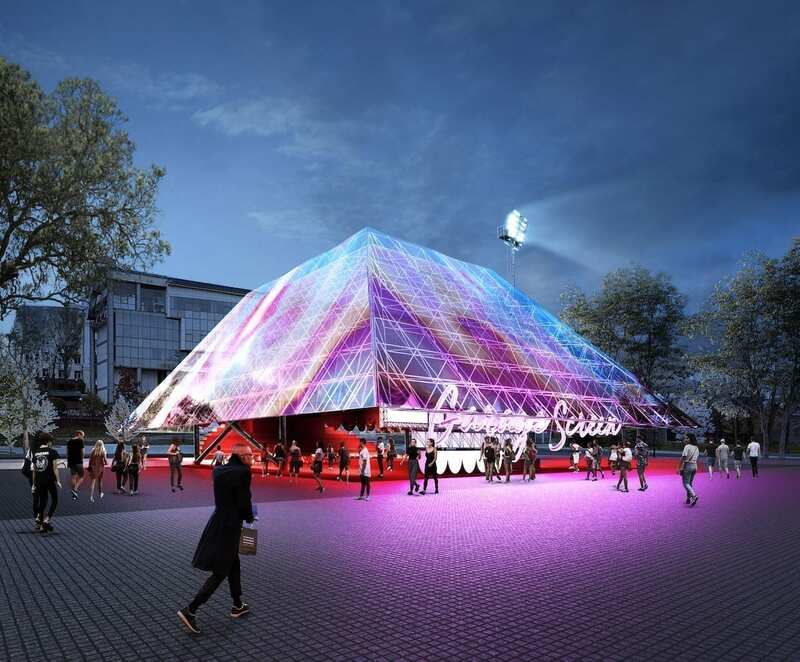 Eric Goldemberg is an architect, with a professional degree from the University of Buenos Aires and a Master of Science in advanced architectural design from Columbia University. Eric is a founding partner of MONAD Studio and a professor at Florida International University.